There are some writers I treasure for their ability to tip me off to other good writing. Alan Jacobs, a good writer himself, is one of those—I’ve probably bought thirty or forty books simply because he mentioned them in passing. One recent book is Being Wrong by Kathryn Schulz. I’d never read her before, but she immediately shot into the upper reaches of my good-writer hierarchy. And I’ve only read about twenty pages of her so far! 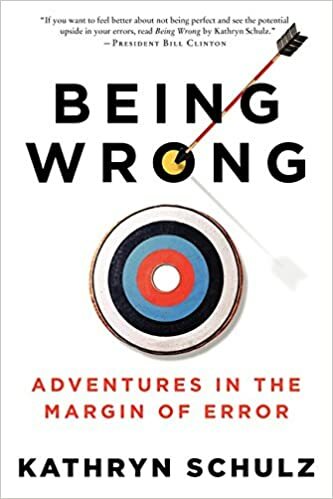 But before we can plunge into the experience of being wrong, we must pause to make an important if somewhat perverse point: there is no experience of being wrong. There is an experience of realizing that we are wrong, of course. In fact, there is a stunning diversity of such experiences. As we’ll see in the pages to come, recognizing our mistakes can be shocking, confusing, funny, embarrassing, traumatic, pleasurable, illuminating, and life-altering, sometimes for ill and sometimes for good. But by definition, there can’t be any particular feeling associated with simply being wrong. Indeed, the whole reason it’s possible to be wrong is that, while it is happening, you are oblivious to it. When you are simply going about your business in a state you will later decide was delusional, you have no idea of it whatsoever. You are like the coyote in the Road Runner cartoons, after he has gone off the cliff but before he has looked down. Literally in his case and figuratively in yours, you are already in trouble when you feel like you’re still on solid ground. So I should revise myself: it does feel like something to be wrong. It feels like being right. It must be fun to write like this, and it must be really fun to peer into such subtleties with clear and unpretentious vision. Schulz is now a staff writer for the New Yorker, so I’ll be tracking down other longform pieces of hers.